There are hundreds of companies around the world manufacturing digital multimeters. Each of them offers several models with slightly different specifications. If judged visually, they all look alike with similar features. It becomes almost impossible to know which one is better than the rest for your requirements. Some of the cheap Chinese products look exactly the same as high-end popular multimeters but lack the same design and safety features. Therefore careful evaluation is a must to choose the best multimeter for your application. Broadly, there are four main criteria for assessing a digital multimeter: measurement confidence, measurement convenience, safety and construction. For all engineering jobs like research, design and testing, measurements have to be correct because all your analysis will depend on the measured value. If a value is not measured correctly, you might end up with no or strange results. There is also a possibility that due to lack of understanding of the technical specification, you are taking these measurements with a wrong multimeter that does not support the range of measured quantity. So understanding technical specifications in the datasheet is a must to select a multimeter that will support the required range. Range. This specification defines the minimum and maximum of the quantities that can be measured without significant errors. This is the first thing that you need to check while selecting a multimeter. If you have to measure electrical lines up to 1000V but have a multimeter that can read a maximum of 600V, you will never get the results beyond 600V. If you are working on low-power circuits, you will have to read currents in microamperes. So you would require a multimeter that can read current in microamperes too. Do check the range of other measurement functions like resistance, capacitance, frequency and temperature also. For regular electronics jobs, the resistance range should be at least 20 megaohms. In case of capacitance measurement, the smaller the minimum range, the better. As very high values of capacitance are not very relevant in electronics, focus on the minimum range here. Frequency measurement is a little overrated feature as nobody will measure frequency using a multimeter. Also, the range of frequencies supported by a multimeter is very small (say, 100 kHz). You would need to measure much higher frequencies when working with electronic circuits and a multimeter cannot be used in that case. Temperature measurement is a handy feature. Normally, multimeters with temperature measurement function are provided with a K-type thermocouple cable to measure temperature. Check the minimum and maximum range of temperature measurement in the datasheet and see if that meets your requirement. Another range that you need to check is the diode function range. 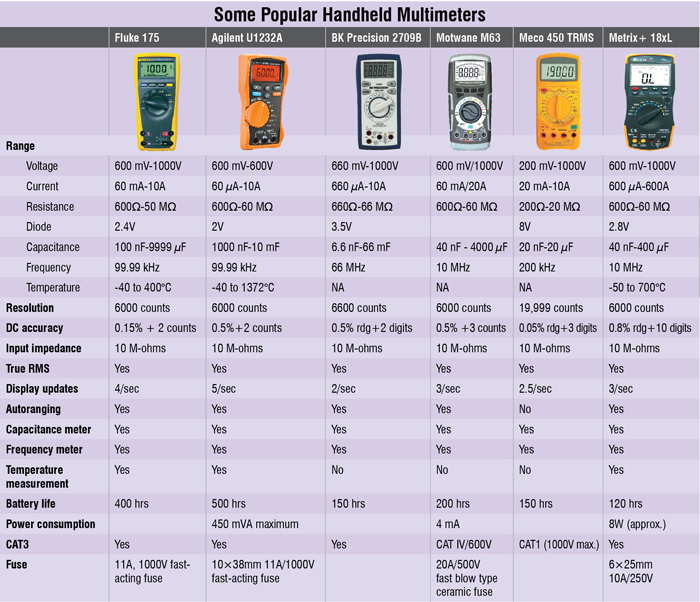 Choose a multimeter with a good range. For example, if the diode function range is only 2V, you will not be able to test an LED with more than 2V forward voltage drop. Resolution. Resolution of a multimeter is the smallest reading that can be shown on the display. Earlier described in digits like 4½ and 5½, these days resolution is specified in counts. To help you understand resolution, let me take the example of a 4.5-digit or 4½-digit multimeter. Here ‘4’ means four full digits that can take up values from ‘0’ to ‘9’ on the display. Fractional digit represents the maximum value that the first digit (most significant digit) can display. In this case, ‘1/2’ or ‘0.5’ means that the first digit can have values ‘0’ or ‘1.’ Therefore 4½-digit means that the display can show values from 00000 to 19999, which totals 20,000 counts. To calculate the smallest reading that can be shown on the display, just divide the full-scale reading by the number of counts. For a 6000-count multimeter with maximum DC voltage range of 600V, resolution will be 600/6000 = 0.1V. Accuracy. Accuracies of all the measurement features are mentioned in the datasheet. First, check basic DC volts accuracy. Accuracy is given in percentage (like 0.5 per cent). For regular electronics work, you need not use a multimeter with a very high accuracy like 0.05 per cent. You can do reasonably well with just 0.5 per cent accuracy. Accuracy of other measurement functions is also important and should be very close to basic DC volts accuracy. Current measurement accuracy will not be so much high as a shunt resistor is used to measure current. Input impedance. 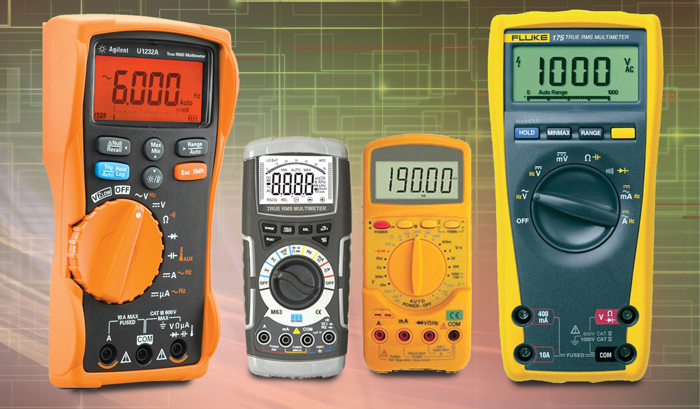 Ensure that the multimeter you choose has an input impedance as high as 10 megaohms. When you measure voltage across a component, you are effectively putting the input resistance of the multimeter in parallel to the resistance of the component. Therefore a small input impedance will change the values you are trying to measure.